Here is a letter I just emailed to celebrity agent, Max Markson. His company (Markson Sparks) is apparently “Australia‘s premier publicity, celebrity management and events organisation”. Perfect. Next time you see me, I’ll be fanning myself with my new money in a carrot-coloured limousine! You were probably just about to call me, so I thought I’d save you the effort of searching for my details. As you know, my name is Ms FOAS. And, yes, I am the world’s leading authority on carrot whittling. See pic below. 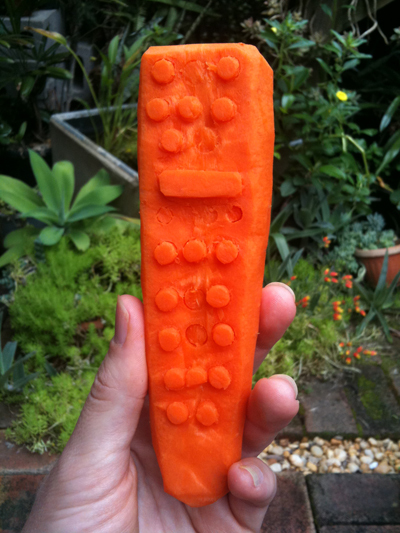 I think you’ll agree that this carrot is a complete masterpiece. It is an exciting piece of art and a thing of beauty to be admired forever. Well, perhaps not forever because my husband ate it. Yes. I know. Have you heard of such a travesty ever befalling the art world? Imagine if Alexandros’s wife devoured the Venus de Milo (although that would certainly explain the missing arms). Anyway, luckily I have photographic proof and a description of how I came to be a carrot whittling expert. At the bottom of my post, you’ll see that I announce my availability for speaking gigs and instructional workshops. Now, I know I lack the attractive sunglasses of Corey Worthington, the peaceful personal life of Lara Bingle, and the sophistication of the Chk Chk Boom girl, but I have carrots. And carrots are making a comeback. Look at our “carrot-topped” Prime Minister, for instance. Carrots are the flavour of the month. And what is that flavour? Carrot, of course. To that end, I’d like to discuss representation with your agency. In fact, I think we should move on this quickly because Oprah is currently in town. Like all rich people, she’d have her own personal carrot whittler. But as my mum always says, “You can’t have too many carrot whittlers in your entourage”. Too funny! Has he responded yet? You must show what he says. Not yet, but fingers crossed! I want to start spending my new wealth. ehehe you are hilarious. i love your blog – always makes me laugh. Thanks! But still no reply. I’m starting to suspect they already have a carrot whittler on their books, hence their hesitation. Damn it! Tsk tsk. You think too small. Why bother with Markson when OPRAH! is in town? I am an idiot. You’re right, I should go to Oprah direct. My people (that would be either Mr Squish, my husband, or one of my turtles) should call her people before she leaves Sydney. 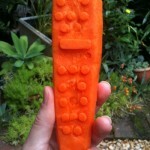 Carrot-coloured limo, here I come!! What a great idea ! I can see an international tour ! You’re a 24 carrot gold certainty to be bigger than Susan Boyle in a heart beat. Thank you for thinking of me … May I sign you to an exclusive representation contract for 5 years plus 5 years and guarantee you an income of $250,000 a year and all the carrots you can whittle for the rest of your life ? Not now, Max. I’m very busy. I think you need a new challenge. Carrots are so 2010. Parsnips were one of the themes on last night’s episode of QI. Think about it: “2011 – the Year of the Parsnip”. I mean, you’d still feel comfortable whittling a parsnip in terms of the shape, the hand-feel and so forth, yet they’re less, I don’t know, quotidian, than your tired old carrot. I’ll have to speak to my agent (see above).